Art Daily is a creative, daily journey that will take you outside your box (a little) and help you use art as a way to explore, to relax, to play. There are no rules or restrictions. Each month Finnabair will post a new challenge with prompts, a theme, and suggested colors. Then you just play! You can even join in online in the Art Daily Cafe linked below. To get you started we have three amazing designers from Finn’s team with us today sharing what they created from the January challenge! “In January we are all going to talk about stories, secrets and mysteries - the ones you know and the ones you are just going to discover, unfold and get inspired with! Svetlana kicks off our art daily expose with this gorgeous piece! She combined Art Daily Vintage Photos and the Planner Sticker Pad - Sentiments, Mechanicals, and Amethyst Icing Paste as her main ingredients! Art Daily doesn’t confine you to an art journal, a layout, or canvas. You create on the media you want, in the size you want, and using the colors you love! “Own Your Story” by Olga Bielska is so gorgeous! 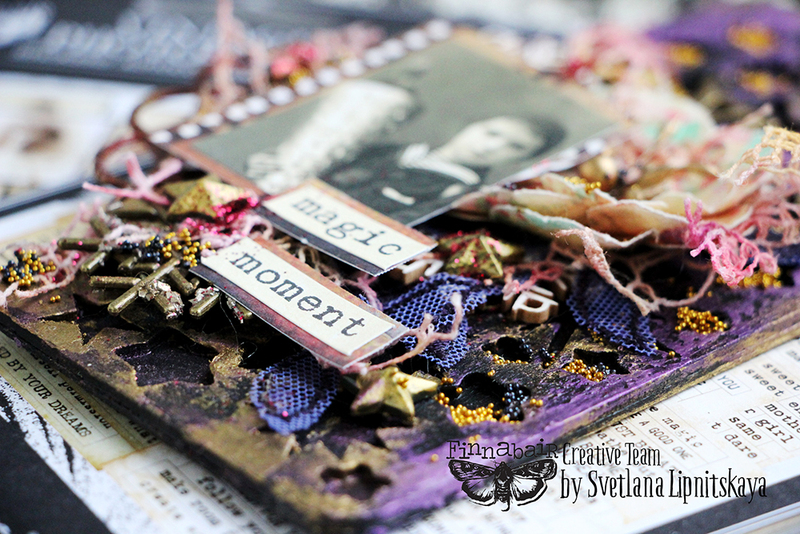 The layers are what really grab our attention as she builds with Finn’s art mediums, Art Daily stamps, stencils, paper, fibers, and the Art Daily photos and sentiments! Our last project is a jaw-dropper! Riddhi Jani created a double-page art journal spread in the most beautiful cool tones! Stamping, splattering, and painting all layer together to create beautiful “white space” while layered vintage photos, words, and tags are clipped in place with one of Finn’s new Art Daily clips! Art Daily Vintage Photos, Art Daily Stamp Sets, Art Daily Clips, Finnabair mixed-media products.